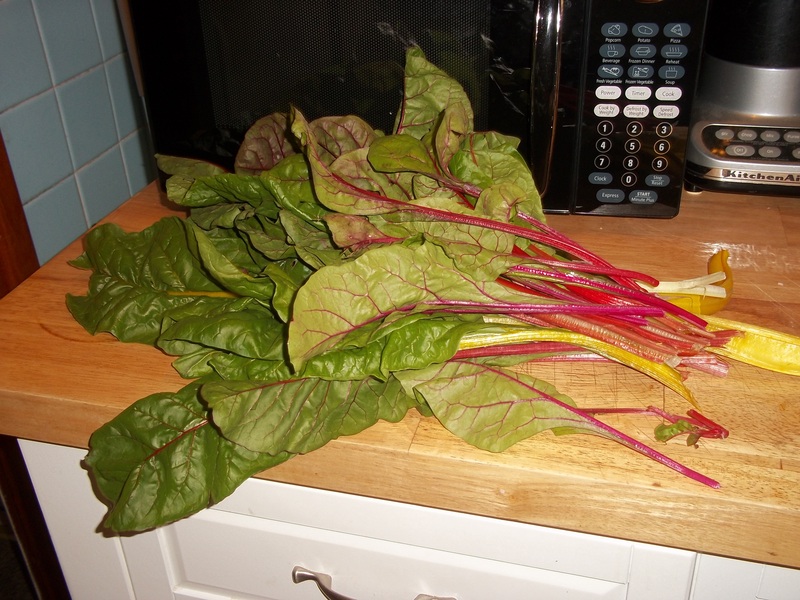 My garden blog was inactive over the winter. I hadn’t intended it to be. I had wanted to post occasionally about the many, many dishes we enjoyed during the winter months from vegetables I had frozen last fall. Instead, I took a well-deserved break. Maybe next year, right? But now it’s time to begin again. 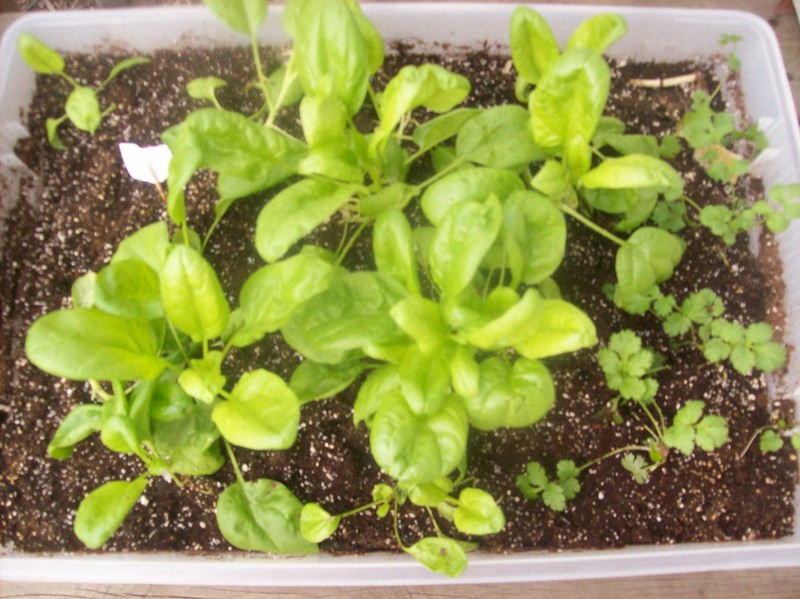 In fact, my 2010 garden actually started taking shape in 2009, when I decided to experiment with growing greens inside. That was largely a failure — the lettuce got aphids and ended up feeding our little rabbit instead of us. EXCEPT, the spinach was quite successful. 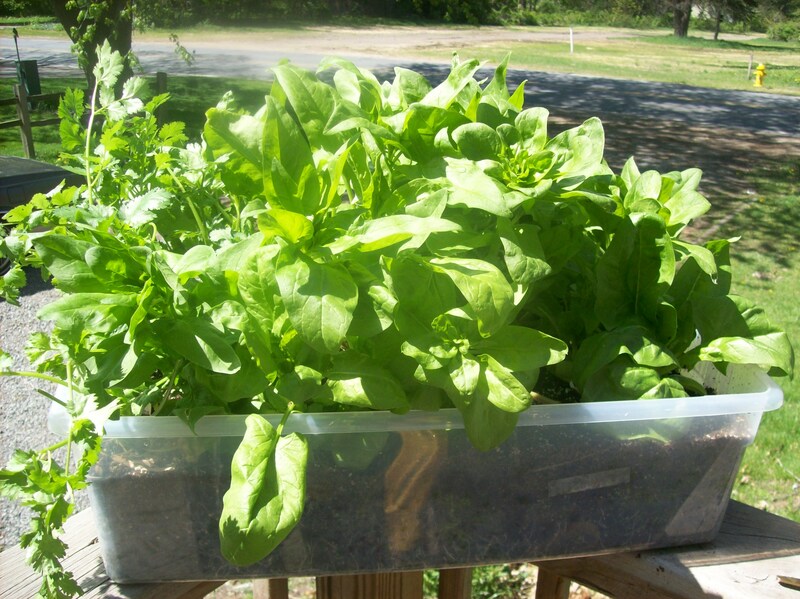 In December, just after Christmas, when I disposed of the aphid-infested lettuce, I planted in its place baby spinach, which is ready to eat right now. I didn’t plant a lot, given that it was essentially an experiment and I only had a little seed left from my spring and summer gardens, but it’s nice to know now what works and what doesn’t. This spinach was sprouted and grown a few inches under the most full-spectrum shop lights I could find. (You'll notice there is a bit of cilantro thrown in as well, an effort to thwart the aphids.) It's now outside on my front porch awaiting consumption. In January I bought garden seeds the very instant they started showing up on store shelves. In mid-February, I began planting, starting first by planting left-over herb seeds from last year. I was completely hopeless successfully starting herbs from seed last summer and ended up buying plants later from the nursery. But I learned a lot in my effort, and I decided to give it another go this year. So far I have thyme, lavender and oregano growing great-guns. They’re still very, very small and tender. 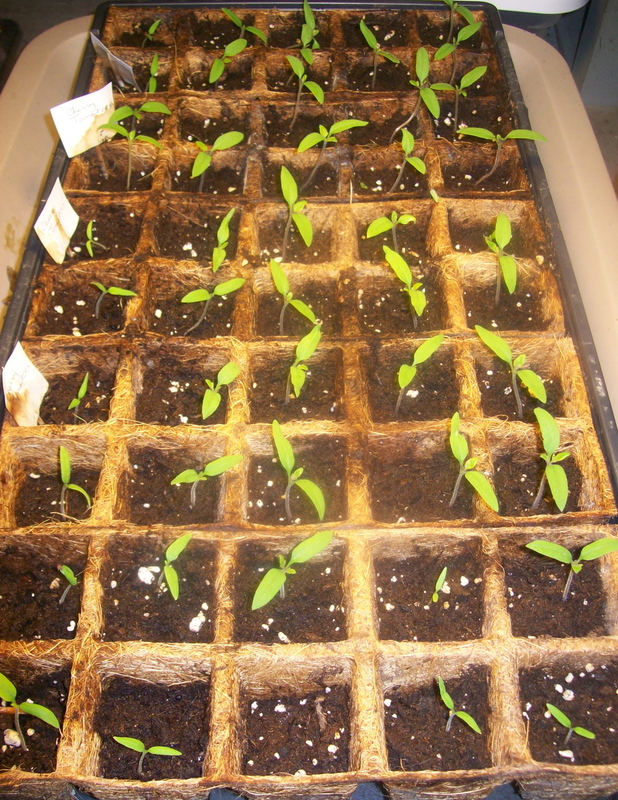 They grow in peat pots filled with seed starting medium, and I mist them daily to keep them hydrated. Still, I had a lot of failure, but the ones that have made it this far seem to be on the road to success. I’ll report in later with full results. Just this week, I also started basil and more cilantro. The cilantro has never given me any difficulty before. We’ll see how the basil does. In late February, I started three varieties of tomato: Roma for making sauce, Beefsteak for sliced tomatoes, and cherry for the kids. I was very successful last year with about 50 plants that I started from seed during the winter producing 38 quarts of frozen tomato sauce. I lost about 20 percent of my harvest at the end of September to late blight — I had been aiming for 50 quarts as I thought we would average one quart a week. The 38 quarts turned out to be plenty, but I’m glad I aimed high because of the loss we incurred. I plan to keep the tomato sprouts inside under the grow lights for another few weeks before I move them to my sun porch. Last year my tomatoes seemed to thrive on that porch before planting outside in mid-May. After I had the tomatoes off and running, I started the crucifers/brassicas. These plants can be put outside as soon as the ground is warm enough to work. I planted them in larger peat pots and will probably keep them inside as long as their pots are adequate for their growing roots. I had beautiful broccoli last year that I started from seed, which gave me the confidence to grow more varieties of crucifers this year. I have planted cauliflower, broccoli, Brussel sprouts, cabbage, kohlrabi, which have all sprouted. The broccoli and cauliflower have been rotated out to the sun porch from the growing lights to make room for more recently sprouted Brussel sprouts, cabbage and kohlrabi. I have a kind of assembly-line rotating system in place this year to make the most of my available space and limited resources. 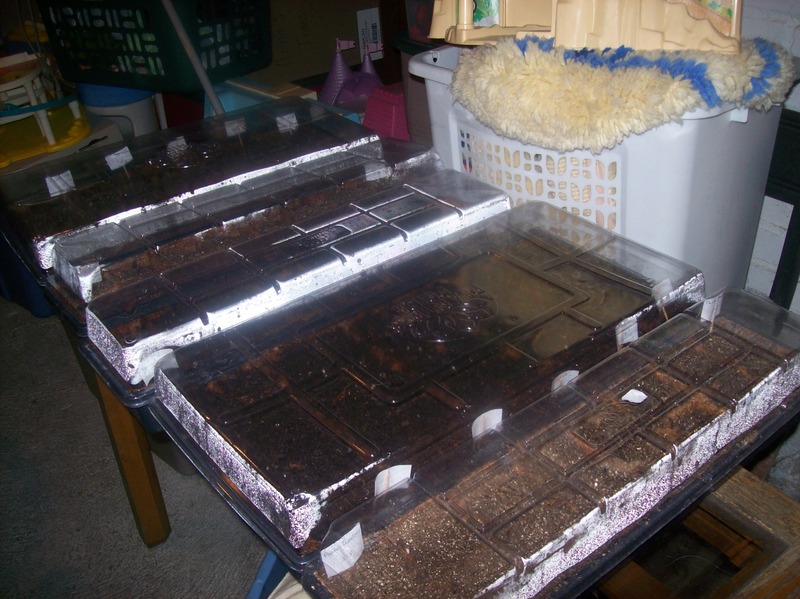 Once the seeds are planted in their peat pots and seed starting medium, I bring their trays down to the basement to await sprouting. 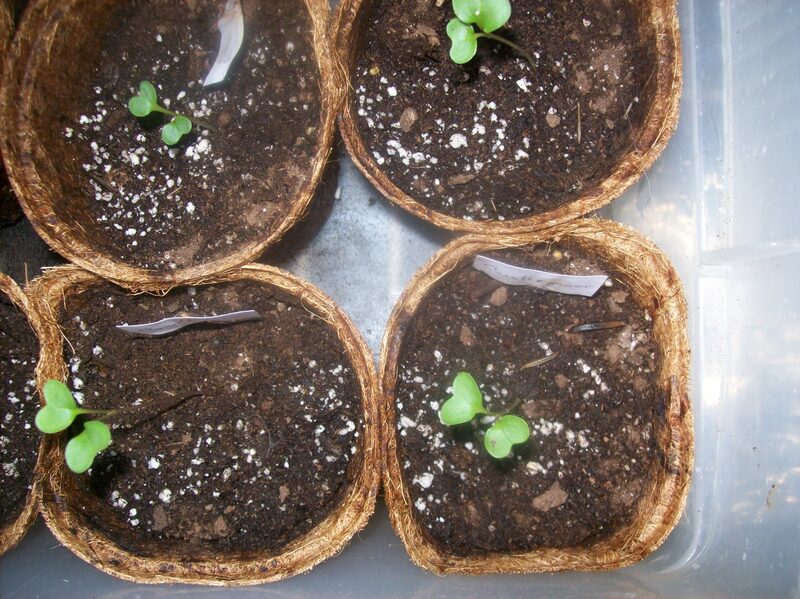 The very first day they pop their little heads out of the soil, they get moved into a room where they will sit under flourescent lights inches from the growing surface. As new sprouts from other varieties move into the light room, the larger or more cold-hardy vegetables go out to my sunporch on the west side of our house. Newly planted seeds don't require light until they actually sprout. These flats wait side-by-side in my basement laundry area. The second I see that they've surfaced (and I check twice a day) they get moved to soak in full-spectrum light. I knew last year, my first year ever as a vegetable gardener, that I was hooked on starting my vegetables from seed. I can’t tell you how proud I am of those 38 quarts of tomato sauce that I grew from a two dollar pack of seeds (plus another twenty dollars invested in starting trays, peat pots and seed starting medium). This year the trays are being reused, and the experience I gained last year with my failures will keep my expenses down even more.